Five years ago, if you’d told a fellow book lover that eBooks were poised to surge in popularity and overtake traditional books, you probably would have been met with a scoff and a dismissal about reading too much sci-fi. And yet here we are: Amazon has just announced that it is now selling more eBooks than it is selling print editions, a mere four years after launching the Kindle. Obviously Amazon doesn’t account for all print or eBook sales, but it’s a very impressive milestone. Then again, the news doesn’t come as a huge surprise if you’ve been following the Kindle’s growth. Kindle eBook sales surpassed Amazon’s hardcover sales back in July 2010, and they surpassed paperback sales in January of this year. But now it’s bested both of them combined. Note that this does not include the free books that many Kindle users take advantage of — these are all paid books. 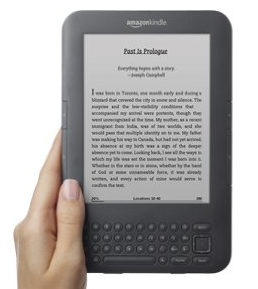 The quick rise of the Kindle can be attributed, at least in part, to the steep price cuts Amazon has been making. A year ago the device cost $259. Amazon slashed it to $189 in June 2010, then began offering a Wi-fi only version last summer for $139. And now it’s gone even lower with an ad-supported version for only $114. Amazon says that this new model, which is called ‘Kindle with Special Offers’, is already selling more than the other Kindle devices. Amazon also says that 2011 has had the fastest year over year growth rate for its U.S. books sales in over a decade, including both eBooks and print — and that Kindle eBook sales are up 3x in 2011 from what they were this time last year. Hey, remember when the iPad was going to kill the Kindle?